Our neck extender option is an excellent choice for cattlemen who desire stability for implants, ear tagging, and neck shots. Extra bars are added onto the front of our automatic reset head gate as seen in the picture below. Holds head more secure for implants, ear tags, shots, etc. A cattle head gate allows the cow’s head to pass through but blocks it’s shoulders. This position allows easy access to work cattle in the chute. 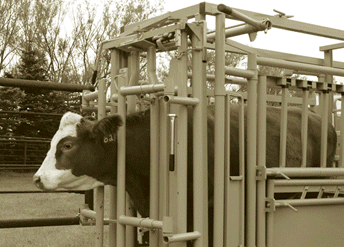 Since we love our automatic reset head gate, it’s included standard on all squeeze chutes, portable handling systems, hoof trimming chutes and 1/4 circular maternity pens. 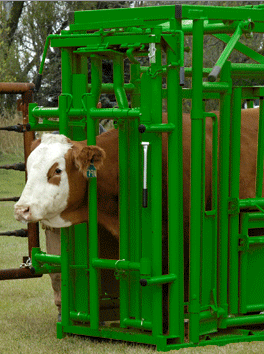 At any rate, cattlemen can easily upgrade to a head gate with neck-extender option. Some customers ask if this can be added at a later date. Since this option is welded onto the head gate instead of bolted, upgrading requires a new head gate. Welding increases the strength and improves operator safety. If cattlemen choose to upgrade to a head gate with neck extender, just remove the current head gate and slip on the new one. 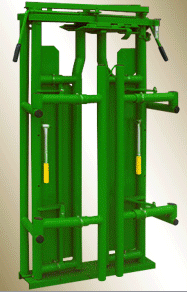 However, many customers choose to a head gate with neck extender if neck stability is necessary.